La Petite Chef Academy (for ages 5-8)Storybook Cooks!The BSC kitchen is the place for little cooks to practice measuring, mixing and knife skills as they make afull dinner menu inspired by favorite children’s books. Read* charming Curious George by Hans Augustoand Margaret Rey and delightful Madeline by Ludwig Bemelmans to your kids (or they can read* them on their own!) and they’ll experience the “worlds” of these classics through food that’s delicious enough for any dinner! 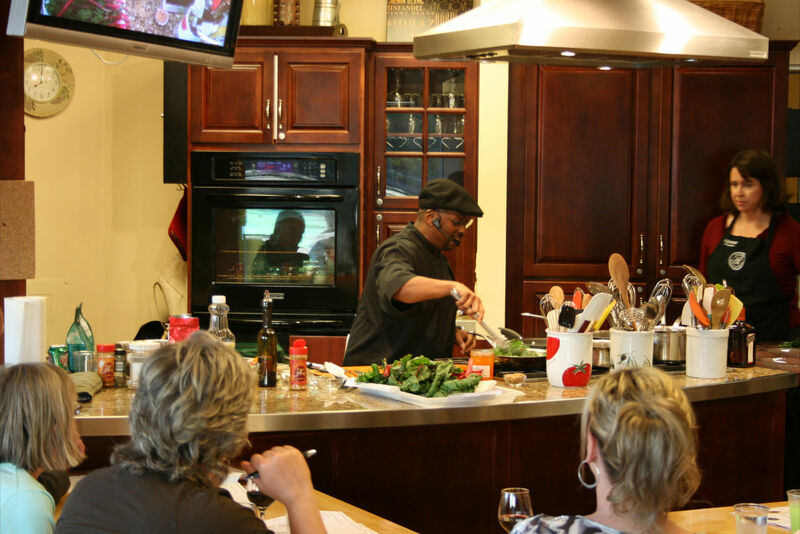 Join us for two days of adventurous culinary fun! Both days run 9-11:00 am. Link: http://www.bayviewschoolofcooking.com/kids.html#lpasumCall (360) 754-1448 to register now! *Reading the books is always recommended,but not necessary to attend camp! Mix & Measure Summer Camps (for ages 9-13)Cooking with the Classics!Young chefs will learn all the basic cooking techniques as they discover and explore four classics of youth literature. Read* them all or just one or two: James and the Giant Peach by Roald Dahl, Redwall by Brian Jacques, Julie of the Wolves by Jean Craighead George and The Lion, the Witch and the Wardrobe by C.S. Lewis. Spend four days creating mouth-watering and imaginative book-themed dinners and gain the skills necessary to make them again at home for the family. Join us as kids take off on a culinary and literary journey they’ll never forget! Each day runs from 9-11:30 am. *Reading the books is always recommended, but not necessary to attend camp! With the exception of maybe around the holidays, I don’t really get cravings for cocktails in the winter and spring. When we’re heading into summer—now that’s another story. There’s something about the frivolous nature of cocktails, and the fact that they’re often made with fresh fruit and vegetables, that makes them perfect for warm summer evenings. The other day, my daughter mentioned how funny it would be if there was a drink called “Tequila Mockingbird” and of course she then had to research it on the internet. And, of course, there are numerous versions of the “Tequila Mockingbird,” not to mention a drink book by the same name, which I promptly ordered for my good friend Mary the librarian, who loves trying new cocktails as much as I do and has a birthday coming up. One recipe that we found online stood out and I had to try it right away. Don’t let the jalapeno scare you away. Unless you don’t like any kind of spice at all, be adventurous! Make it when you can get your hands around a really good watermelon. I quadrupled the recipe because it’s tedious making one cocktail after another. It’s herbaceous, summery and it has tequila in it—in short, it’s delicious! By the way, Tequila Mockingbird by Tim Federele, arrived in the mail—it’s a hoot and comes highly recommended. and many other tasty options! Ritu brings some of the most beloved dishes in India to the table in this class that’ll make it easy for you to prepare this wonderful food at home. She’ll begin by preparing Vegetable Pakoras and Paneer Pakoras, delectable little fritters. Also on the menu are three kinds of Parantha, hearty stuffed flatbreads —Cauliflower, Potato and Spinach. Cucumber and Tomato Raita, Cumin Rice and Cilantro Chutney are the traditional accompaniments to these treats. Ritu offers Semolina Pudding with Almond and Raisins as the lightly sweet ending to the meal. 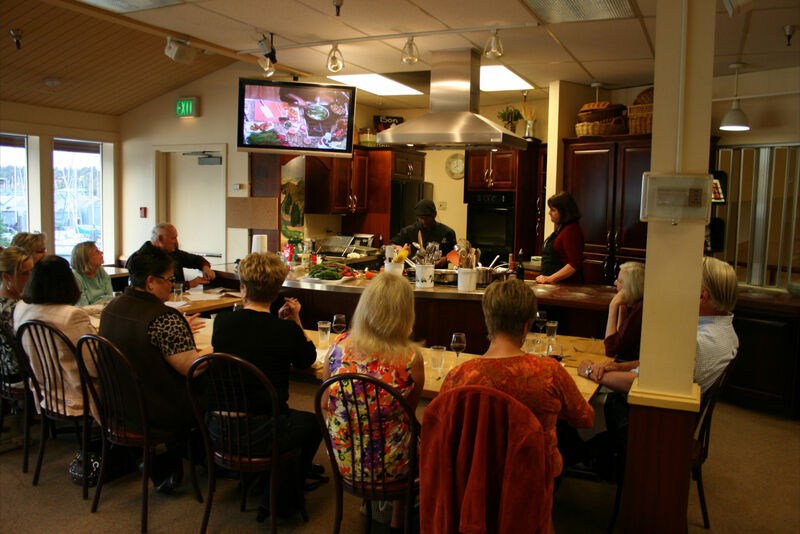 Many of you may be acquainted with dynamic Chef Amadeus because you’ve seen him in action at the Pacific Northwest Mushroom Festival every year or on the Food Network. The Jacksonville, Florida native, charming radio personality and creator of Southern Passion Salt-Free Spice Blends (soon to be available at Bayview) is stopping by BSC for an evening of fun and incredible food. 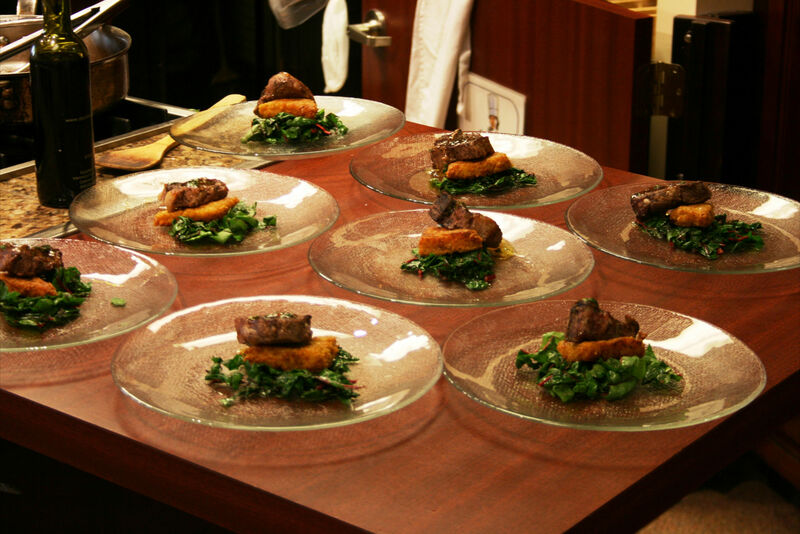 He’ll be serving up Stuffed Mushrooms with Scallops and Kale Salad, Lamb Chops with Cognac-Mint-Citrus Jelly served with Curry-Crusted Risotto with Chard and a decadent Banana Foster with Roasted Butternut Squash. Come and experience the amazing Chef Amadeus!